Have you ever yearned for the soft touch of a pancake? 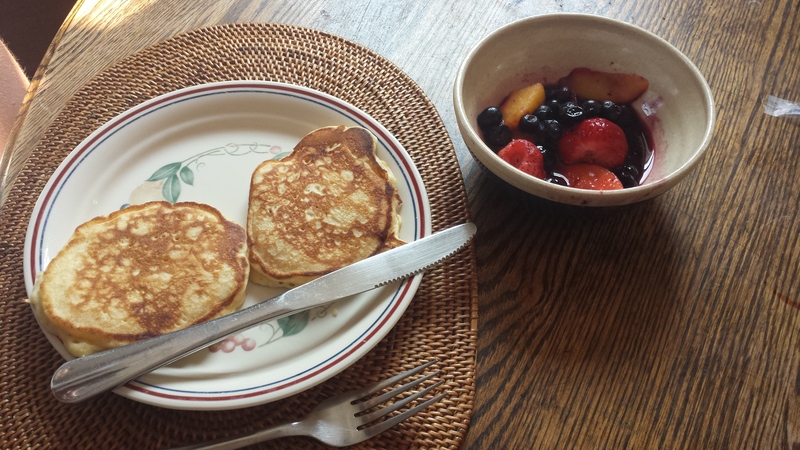 Pancakes and flapjacks played an important role in early BC food history. Camp cooks worth their salt[i] were expected to rustle up pancakes at the drop of a hat. The right combination of ingredients will produce a fluffy, memorable pancake. Barss (2016)[ii] tells us that cowboys and chuckwagon cooks never followed a written recipe for flapjacks. “They remembered the proportion of 1 for 1 for each ingredient – that is, 1 cup flour, 1 cup liquid, 1 egg, 1 rounded teaspoon of baking powder, 1 spoonful of melted fat or drippings, and a pinch of salt” (p. 60). There’s true chemistry in these ingredients. Flour contains a protein called gluten which, when mixed with liquid, forms an elastic network of strands. When a leavening agent such as baking powder or baking soda is included with the flour, a chemical reaction between the ingredients is set off that creates carbon dioxide gas. The gas bubbles expand and cause the product to rise. In cakes and breads a few things can go wrong, but pancakes are very forgiving. One unforgivable mistake (in my mind) is to use too much baking soda or substitute it directly for baking powder. The end result is a metallic-tasting product. Baking soda (an alkaline) needs an acid such as buttermilk to neutralize it. That’s why recipes often include baking powder (a complete leavening system) as well as soda. Here is a pancake recipe that has been tested by thousands of grade eight students and guarantees a perfect result if followed to the letter, and pretty good results even if not. The camp cook would scoff regardless. [ii] Barss, B. (2016. Come ‘n’ get it: Roundup recipes from ranch country. Heritage House. In a small mixing bowl beat egg until frothy. In a medium mixing bowl combine dry ingredients. Add liquid ingredients to dry ingredients mixing until just combined. Batter should be lumpy. Heat frying pan over medium heat. Add a small amount of shortening. Test pan with drop of water. Should sizzle. Pour approximately 60 mL (1/4 c.) of batter for each pancake. Turn pancake when bubbles form and begin to break on top side. Cook 30 seconds to 1 minute on second side. Place on cookie sheet in single layer and keep warm in a low temp. oven (250° F). Perfect recipe for pancakes. And it’s very good for ten year olds to try because it’s almost impossible to goof it up. We never use vanilla (missing from the ingredient list) but I’m sure it would be OK. Topped with thick yogurt, fruit of choice and maple syrup, these pancakes keep everybody happy until lunch.